Why the pulpy young adult novel, you ask? Yeah, this isn’t any Flowers to Algernon or the classics they spoonfeed you in school. 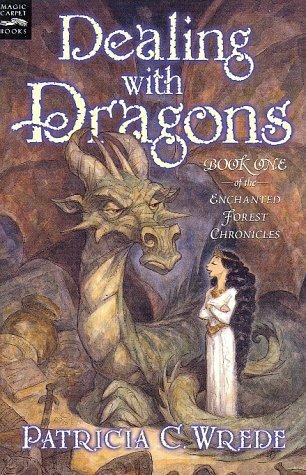 However, I definitely have to say, Patricia C. Wrede’s oft underrated series definitely left a mark on my life and my writing. The story is great–I could read it again and again, but what I found so profoundly refreshing was the heroine. As a tomboy, I had a tough time finding females in fiction to connect with, especially in older novels. Mind you, I mainly stayed within the fantasy genre, however across the board complex women were the exception not the standard. So often, you’d have a simpering, whiny princess, or some aloof and reserved queen that always held their temper and never said a bad word. Or just went gunning for the stereotypes like the beloved Belgariad and the Mallorean, where Ce’Nedra’s irrational behavior and lack of communication is attributed to her womanhood. On the flipside, if the ladies were tough in books, they were these sexpots that wielded sharp sarcasm and even sharper blades. Cimorene was different. She was practical, stubborn, and didn’t give a damn about what people thought. While she had tomboyish tendencies, she wasn’t afraid to get neck deep in cooking and cleaning either. After glossing over so many caricatures of women, it was refreshing as a kid to find a heroine so realistic. As the series continued, I only admired her more, especially watching the banter between her and Mendenbar, because they operated as equals from the very beginning. So, if you haven’t read Dealing with Dragons, do yourself the favor. Plus, if you have kids, it’s a great option to read together. The Enchanted Forest Chronicles is a fantastic place.